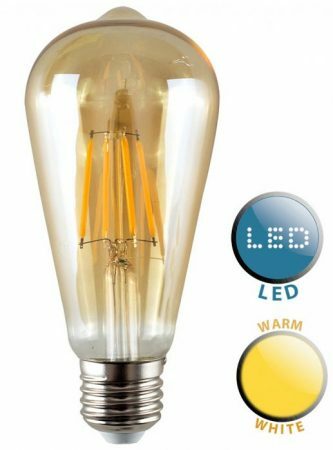 This pear shaped E27 filament LED amber light bulb in warm white and 440 lumens output that is a direct replacement for a 40w incandescent lamp. Warm white 2700 kelvin, with amber glass for a vintage look. This bulb looks great in vintage and industrial style fittings or just as a decorative bulb for mood lighting. This pear lamp features the latest in LED technology. Designed to look like original incandescent lamps, whilst offering all the advantages of LED, such as low running costs, this lamp is an ideal replacement for all decorative light fittings. The light produced by this light bulb is identical to the colour of an incandescent lamp, but does not contain infra-red, ultra-violet light or give off a great deal of heat. The light is uniform and gentle on the eyes. This LED filament lamp gives a 360° light spread and looks just like an old fashioned incandescent light bulb. Now you can save money and they look great too.